As we're approaching the end of 2018, you've only got a few months left to take advantage of the biggest incentives you can claim for your (first) electric car! 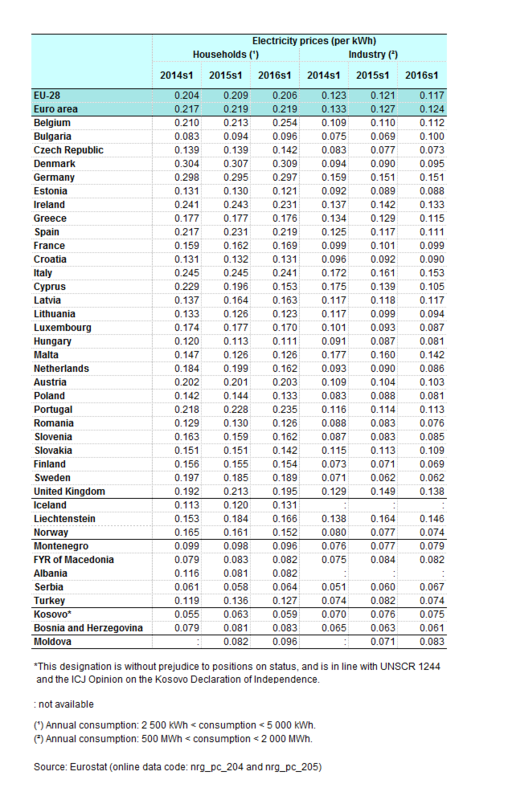 We've listed the three biggest incentives per country here. Though not much of an early adopter, Belgium is catching up rapidly. In 2016, the number of electric-car sales in Belgium almost tripled, and the number of charging points grew by 350% as compared to 2015. Living in Belgium? You can find the most public charging locations in Antwerp, Brussels & Ghent. Prefer charging at home or at work? We do too. Request a charging point here. France made tremendous gains in electric-car numbers over the past few years. Going from less than 10,000 registered electric vehicles in 2012, to over 115,000 in 2017. Living in France? Your best bet on finding a public charging point is in the Southwest of France. Prefer charging at home or at work? We do too. Request a charging point here. The UK government pledged a £290m sum to boost the industry of low emission vehicles. £80m of this amount is dedicated to improving charging infrastructure for electric vehicles. Living in the UK? Most of the public charging points are located in Glasgow and North East. Prefer charging at home or at work? We do too. Get up to 75% off of the installation of your charging point at home or at the workplace with the OLEV grant. This equates up to £500 (incl. VAT) per household / eligible vehicle! Request a charging point here. Home to the most beloved combustion engine car manufacturers, German has been the slowest of the bunch in pushing pro-electric plans. But as of last year, Germany has adopted an incentive and investment program to encourage a switch to plug-in hybrids. Additionally, it has approved a push for a Europe-wide ban on combustion engine vehicles by 2030. 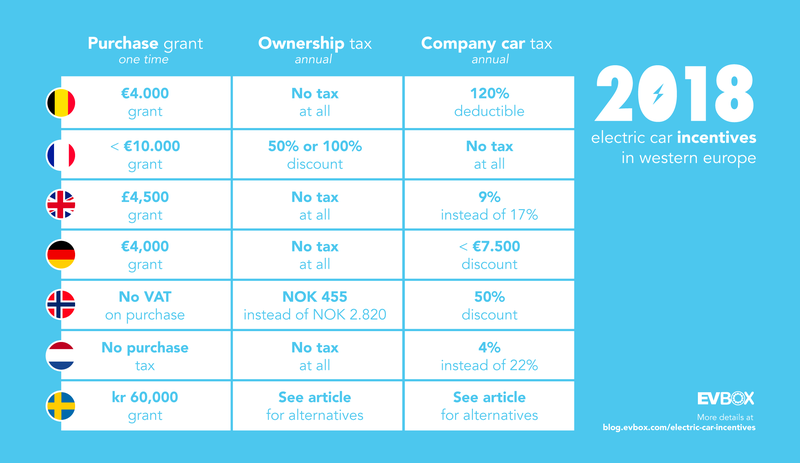 Ownership tax: 10 year exemption for fully-electric vehicles registered between 2011 and 2020. PHEVs pay the tax, which is lowered in proportion to their lower CO2. Living in Germany? Stuttgart is your best bet in finding a public charging points! Prefer charging at home or at work? We do too. Request a charging point here. Norway’s original goal was to have 100,000 electric vehicles on the road by 2020. As of last year, Norway has already exceeded this number, as there are now more than 121,000 electric vehicles on the Norwegian roads. Quite impressive for its relatively small population of just 6 million. Living in Norway? The most public charging points are located in Bergen and Oslo. Prefer charging at home or at work? We do too. Request a charging point here. the highest ratio between public charging points and electric vehicles. 47% of Dutch drivers often or always charge at work. Driving in the Netherlands? Public charging points are all over the place! Most of them are located in Amsterdam and Utrecht. Prefer charging at home or at work? We do too. Request a charging point here. Sweden is investing heavily in charging infrastructure and the promotion of sustainable vehicles. Take a look below to see how you can navigate the Swedish incentives jungle. ‘Super environment-friendly car’ Grant was replaced On July 1, 2018, by a ‘bonus malus-system,’ where environmentally friendly vehicles with relatively low emissions of max 60g CO2/km are eligible for a grant. Every vehicle can get a premium worth up to 60,000 SEK (approx. 6,000 euros) and is given to both individuals and businesses. The bonus is given at a maximum of 25% of the cars (new) purchase price. You can calculate your bonus here. ’Klimatklivet’ is an investment incentive for local and regional projects which aim to reduce CO2 emissions. All types of organizations, companies, municipalities, foundations and associations such as housing associations can seek investment support from ‘Klimatklivet’ for charging stations. The grant covers up to 50 % of the investment and is divided per two categories; not publicly built on an individual parking lot and publicly available to the public. The grant is given four times a year. Find the application periods here. ‘Klimatklivet’ is exclusively designed for businesses and public associations. For individuals, there's the ‘Charge at Home’ incentive instead. ’Charge at Home’ Incentive is granted to individuals who own a private property with ‘a right to use’, meaning that you have the right to install a station. The grant can be given up to six months after the station is installed and covers 50% of the cost of the charging station and installation. Please note that each contribution is limited to 10.000 SEK per property. Living in Sweden? Your best bet for finding a public charging point is in Stockholm, Skåne, and Västra Götaland. Prefer charging at home or at work? We do too. Request a charging point here. Excited? There are plenty of perks too. You get a car. And you get a car. Everybody, go get an electric car! Follow us on Twitter and Facebook for all things exciting in sustainable tech and transportation. 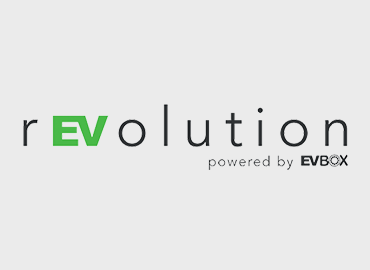 For the EV-savvy amongst us, share your thoughts on the latest industry developments on LinkedIn. No time to read? Tune in on Instagram and YouTube for a peek into the wondrous world of EVBox & electric mobility.